#GIVINGTUESDAY, is an international day of giving. Join the movement. We have two days for saving: Black Friday and Cyber Monday. On Tuesday, November 27, 2018, we have a day for giving: #GivingTuesday. On #GivingTuesday, corporations, religious organizations, families, charities and individuals from around the globe will join forces for one common purpose: to celebrate generosity and to give. In celebration of #GivingTuesday, let’s push our differences aside to create a better world for all – a world where everyone has a safe, decent and affordable place to live. GIVE A DUNK FOR #GIVINGTUESDAY! United by the love of Habitat, the staff members of Beaches Habitat for Humanity will stop at nothing to see our mission of eliminating substandard housing in the Jacksonville Beaches come to fruition! To that end, we are subjecting ourselves to the dunk tank to show how much we care! And YOU get to choose who gets dunked! From now until midnight on #GivingTuesday, November 27, 2018, you have the opportunity to donate any amount to send a staff member to the dunk tank! This is the opportunity of a life-time! At midnight on November 27, each staff member with over $1,000 raised will be sent to the dunk tank on Friday, November 30. The dunking will be streamed live and recorded so viewers can re-live this glorious scene for years to come. 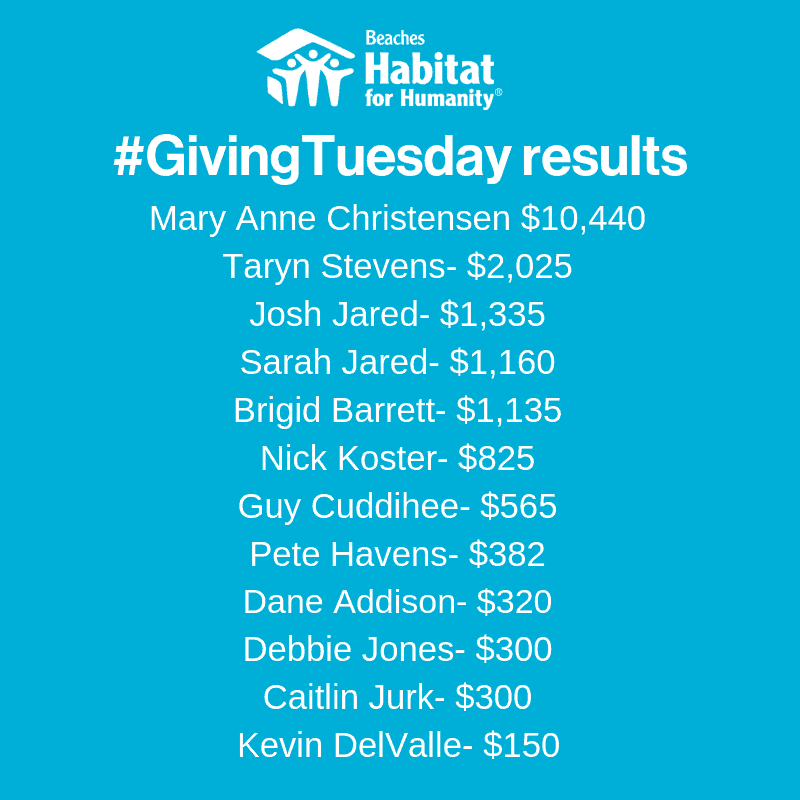 Beaches Habitat for Humanity is built on a foundation of sustainability, every penny of your donation will be used to help sustain and expand our efforts of eliminating substandard housing in our community! Beaches Habitat for Humanity, Inc. is a 501 (c)(3) organization. Your gift is tax-deductible to the fullest extent allowed by law. Please consult your tax advisor for full information. We respect your privacy and will never share your name or personal information about your contributions with any outside entity. #GIVINGTUESDAY isn’t just about monetary donations. Pledge your time by volunteering! Our volunteers build alongside our partner families every day on the construction site, making a tangible difference as walls are raised, rooms are painted, and roofs are shingled. Don’t forget about corporate matching gift programs! Many companies match donations made by their employees which means the impact of your donation could be magnified by taking a few extra minutes. Visit https://doublethedonation.com/giving-tuesday/ to access the appropriate forms or guidelines for your company. If you have any questions regarding the matching program, please contact us at 904-595-5805. ← Thanks for a great Beach Bash 2018!